Health Minister, Hon. Christopher Tufton (2nd left), cuts the ribbon to officially commission into service a vertical wheelchair lift installed at the Jamaican Association on Intellectual Disabilities (JAID). The commissioning ceremony was held on June 22 at the association’s headquarters at 7 Golding Avenue, St. Andrew. Others (from left) are Distinguished President for the Kiwanis Club of Constant Spring, Deborah Manning; Sales Manager for Hyundai, Carlos Geourzoung; and State Minister for Finance and the Public Service and Member of Parliament for St. Andrew Eastern, Fayval Williams. 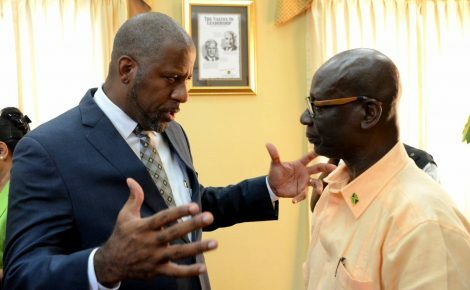 The Jamaican Association on Intellectual Disabilities (JAID) has commissioned into service a vertical wheelchair lift, which was recently installed to facilitate ease of access for persons with mobility challenges. The lift, purchased at cost of $8 million, will transport persons who use wheelchairs, prosthesis and adaptive aids such as crutches, canes, and walkers. Students of the Randolph Lopez School of Hope located at the JAID’s premises at 7 Golding Avenue, St. Andrew, will also benefit from the use of the lift. Health Minister, Dr. the Hon. Christopher Tufton, who brought greetings at the commissioning ceremony on June 22, commended JAID for its tireless efforts to improve the quality of life of persons with disabilities, through social inclusion and participation services. He also hailed the public- and private-sector partnership that made the project a reality. Funding to purchase and install the lift was procured through the Kiwanis Club of Constant Spring; Culture, Health, Arts, Sports and Education (CHASE) Fund; the National Health Fund (NHF); and Magna Motors, which are dealers forHyundai. “Today represents that true spirit of partnership, charity and volunteerism, which is essential in building a civilised society,” Dr. Tufton noted. State Minister for Finance and the Public Service and Member of Parliament for St. Andrew Eastern, Fayval Williams, who also attended the ceremony, said that the constituency has the largest population of persons with disabilities. “Beyond what we have done so far, there is a lot left to be done and we are committed to continue to do that work so that the lives of persons with disabilities can be made better,” she said. President of JAID, Sonia Jackson, also expressed gratitude to the donors. She said the Association plans to engage other entities to address additional areas of need. “We have had this dream for a long time of getting the building fully compliant with the requirements of the Disability Act… . One of our plans is to develop an advocacy programme that will enable us to build relationships with other organisations to fill the gaps in other areas,” Ms. Jackson said. Installation of the wheelchair lift took place between 2014 and 2016. With the apparatus, JAID is now compliant with Article three of the Convention on the Rights of Persons with Disabilities, which speaks to fair accessibility. JAID is a non-governmental organisation (NGO) that has been providing services to persons with intellectual disabilities and their families for more than 60 years. The institution also provides special education through a network of schools serving children and youth with a range of intellectual, physical, mobility challenges and other developmental disabilities. The Randolph Lopez School of Hope is the largest of the five clusters of schools within the JAID network with an enrollment of 571 students.